To make the pickled cucumber, place the sugar, vinegar and salt in a non-metallic bowl and stir until dissolved. Add the cucumber and stir to combine. Set aside. Place the rice and water in a saucepan over high heat and bring to the boil. Reduce the heat to low, cover with a tight-fitting lid and cook for 12 minutes. Remove from the heat and set aside for 10 minutes or until the rice is cooked. Place the vinegar, sugar and salt in a non-metallic bowl and stir until dissolved. Spread the rice over the base of a large, shallow non-metallic dish and sprinkle with the vinegar mixture. Stir with a spatula for 5 minutes or until cool to the touch. Line a 20cm x 30cm cake tin with plastic wrap. Line the base of the tin with the prawns. Top with the rice and press down firmly. Place a sheet of non-stick baking paper on top and fold over the plastic wrap to enclose. Place a piece of cardboard on top and weigh down with cans. Refrigerate for 1 hour. 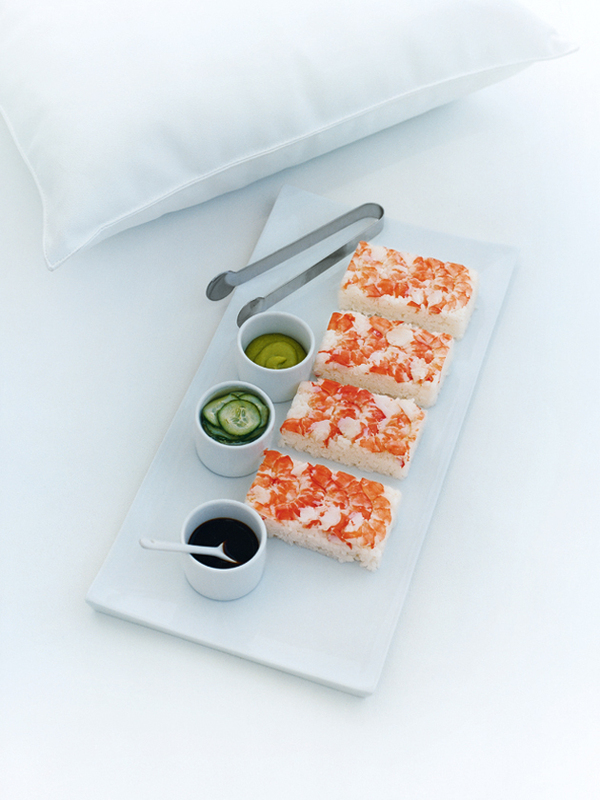 Turn out, slice and serve with wasabi, soy sauce and the pickled cucumber. Serves 6.